High-Energy, Bible-centered, and Community Focused! 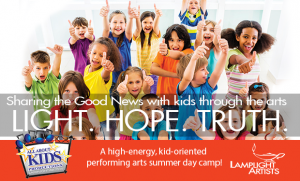 Designed for kids who are entering grades two through eight, ALL ABOUT KIDS PRODUCTIONS is a high-energy, kid-oriented performing arts day camp. Music, acting, stage movement and dance are combined with Bible study, hands-on instruction, plenty of laughter, and just the right amount of hard work to create an awesome week of challenge and growth. 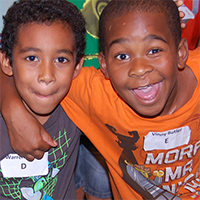 Kids learn Biblical principles for life’s choices as they enjoy a great week in the performing arts! Creative and interactive Bible studies prepared on a kid’s level lay the foundations for helping kids understand the Biblical truths they are exploring throughout the week. Concepts are reinforced through artistic expression; practical applications help kids think about everyday life choices. From up-tempo, energetic music to strong melodic ballads, the music helps build strong foundations for truth. Singing, acting, and dancing to music brings lyrics to life, helping kids to remember and internalize truths learned. Drama games are an important part of our program and are used as building blocks. They teach performance skills, build confidence, fuel friendships, enable the kids to grow as an ensemble and help release the imagination to get the creative juices flowing. Kids have a blast! What kid hasn’t reenacted some funny moment in slow motion, or used exaggerated movements to liven up a story? Or who hasn’t started to dance when a favorite song is played (when no one is looking, maybe?)? It’s as natural as it is fun! 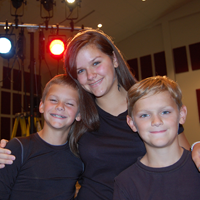 Acting, choreographed movement, and dance are great teaching tools as well.